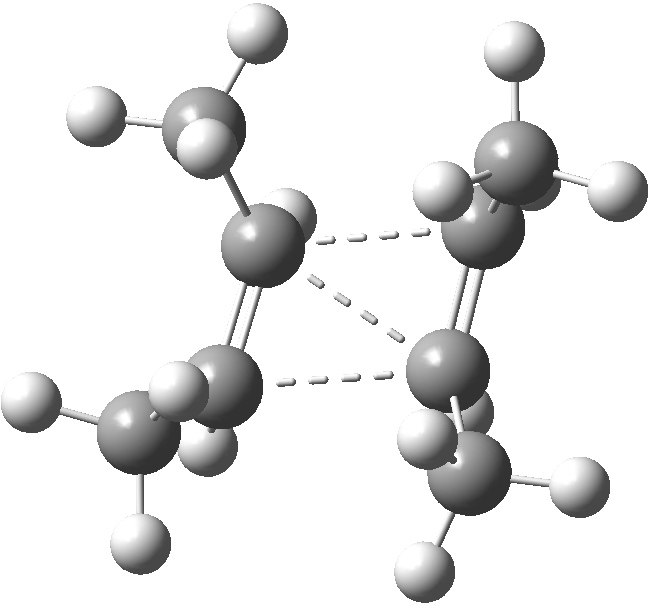 A modern take on the pericyclic electrocyclic ring opening of cyclobutene. A modern take on pericyclic sigmatropic migrations. The π2 + π2 cyclodimerisation of cis-butene is the simplest cycloaddition reaction with stereochemical implications. I here give it the same treatment as I did previously for electrocyclic pericyclic reactions. The photochemical reaction is known to give a mixture of two tetramethylcyclobutanes in the ratio of 1.3:1.0, with the all-cis isomer apparently predominating. The key geometry is the conical intersection, at which the energies of the S1 and S0 states coincide. This geometry has a typical trapezoidal appearance, with suprafacial addition accross both components. The exo addition is calculated to be about 1 kcal/mol lower in total energy than the endo (at the CASSCF(12,8)/6-31G(d) level), which implies that the latter should be the minor and not the major form. However, these CASSCF energies are not corrected for thermal (entropic) or dynamic correlation components, and moreover the active space orbitals are probably not identical either (I demonstrated in another post how the orbitals of the alkene interact with those of the methyl groups, and its quite likely that the endo and exo orientations will result in slightly different interactions) which makes such comparisons non trivial. These calculations do support the idea that both isomers should form (which at first sight might be counter-intuitive given the apparent steric constraints of the endo isomer). 2+2 endo addition. Click for 3D. The thermally activated reaction is not known for this alkene, and the calculations support this with an enormous barrier to reaction (> 68 kcal/mol). As a 4n-electron pericyclic, the selections rules require there to be one antarafacial component present, and the IRC for this reaction illustrates this very nicely. The formation of two pairs of C-C bonds is very asynchronous. Only when the first bond is almost complete does the second C=C start to rotate. 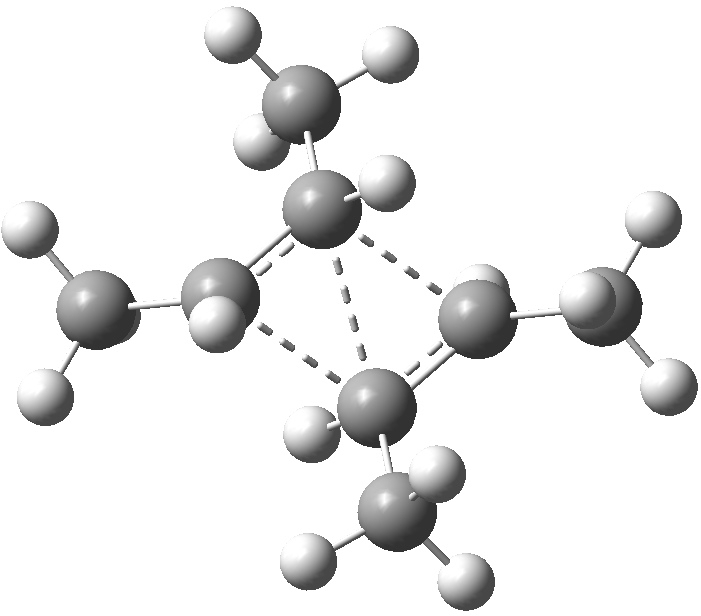 The second C-C bond only starts to form after this rotation (the antarafacial component) is essentially complete, forming a product where one methyl group is on the opposite face of the ring to the other three. Note in particular that the rhs alkene has the two C-H hydrogens synplanar to start with, but that they are exactly antiperiplanar in the product. For this small system the two critical points, a conical intersection and a transition state, could not be more different. But they do capture the essential features of pericyclic reactions and their selection rules. This entry was posted on Monday, November 28th, 2011 at 3:18 pm and is filed under Uncategorized. You can follow any responses to this entry through the RSS 2.0 feed. You can leave a response, or trackback from your own site. A modern take on pericyclic cycloaddition. Dimerisation of cis-butene is licensed by Henry Rzepa under a Creative Commons Attribution-Noncommercial-Share Alike 3.0 United States License.